Marhaba Beachfront Chalets - Hibberdene Accommodation. We are right on the beach front, 500m from shops and main beach. Walking from your patio, it is just a stroll to the end of the garden and onto the beach. All chalets are fully equipped with crockery, cutlery, bedding, colour TV, ceiling fans. All units have their own satellite dish for DSTV. You need to bring own bath and beach towels, DSTV decoder with card for full DSTV. Unit 1: (sleeps 8) two bedrooms (one being a loft room) and two bathrooms. Unit 2: (sleeps 4) one loft room bedroom and one bathroom. Unit 3: (sleeps 6) two bedrooms (one being a loft room) and one bathroom. Units 4 to 7: are duplexes with one bedroom and bathroom upstairs and downstairs there is a kitchen and lounge with a double sleeper couch and a single bed beneath the stairs. Unit 8: (sleeps 4) single storey unit, with additional bed in the bedroom and one bathroom- great for young children (situated a little away from the swimming pool). The one and two bed roomed chalets (sleeping 2 to 8 people) are open planned and tastefully decorated, with a large living room, fully equipped kitchen and bathrooms. The units have colour TV with M-Net and are fully tiled. Each chalet has a patio overlooking the swimming pool, with its own braai facilities; from there you can enjoy listening to the waves crashing on to the rocks. All linen is provided except for towels. The resort is fully secured with remote controlled access. Hibberdene is famous for is white sand and long stretches of beach. The main Hibberdene Blue flag beach is 500m away; the beach has shark nets and lifeguards on duty. During the holiday season, there are a number of organized children activities taking place on the beach. Dolphins and Whales are regularly spotted and the annual sardine run is on your doorstep. 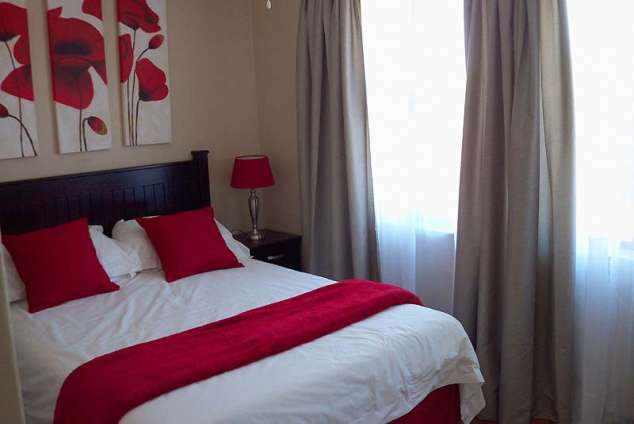 The Hibberdene CBD is at the end of the street, 500m stroll, you can buy all the necessities that you will need. Hibberdene has a Super Spar, major banks, Wimpy, Foodzone, KFC, Fish Shop, Petrol Station, Bimbo, Bottle Stores and a variety of beach shops. 131616 page views since 10 Sep, 2004. Last updated on 31 Oct, 2018.